The Annual Meeting of the Suburban Coalition will be held on July 10, 2017 at 7:30PM at the Central Administrative Offices of the Lynnfield Public Schools, 525 Salem Street, Lynnfield, MA. (The entrance to the Central Offices is in the back of the building.) We respectfully request that a representative from your board attend the Annual Meeting. The agenda for this meeting will include a motion to dissolve the organization. The Suburban Coalition is an all-volunteer organization and for the last three years, we have been unable to find enough volunteers to carry out our mission in a sustainable manner. Therefore, the officers believe it is now time to discuss dissolution. Please RSVP to dorothypresser@suburbancoalition.org and let us know if your board will be participating in the annual meeting. Without a quorum, we will be unable to conduct the business of the meeting. A quorum is defined in the by-laws as representatives from five member boards. that they have passed the resolution. If your board or committee’s name should be added to this list, please let us know. Why is this so important? The Governor’s budget for FY17 increases Chapter 70 by only 1.6%. It does nothing to recognize the findings of the FBRC regarding the systemic underfunding of the Foundation Budget in the areas of Special Education and employee health insurance. The estimated amount of this underfunding is approximately $2 billion. While the Governor’s budget seems to honor the commitment to share revenue growth with municipalities by increasing Unrestricted General Government Aid (UGGA) by 4.6%, it ignores the fact that for most communities, the largest portion of local aid comes from Chapter 70. The issue of underfunding affects every aspect of municipal operations. When Chapter 70 aid is inadequate, municipalities must depend on the local property tax to make up the difference. A strong system of public education helps drive and sustain a strong state economy. It does the same for our communities. Let your legislators know that we are looking to them to implement the recommendations of the FBRC beginning with the FY17 budget by passing the Resolution Calling for the Full Funding of the Foundation Budget Review Commission’s Recommendations. The Suburban Coalition is a statewide organization of local officials that advocates for the resources, funding and support at the state level to sustain thriving communities throughout the Commonwealth. We work to ensure that every municipality has the resources to provide high-quality essential services of life safety, education and infrastructure maintenance to its citizens. We provide input to the state about local services, state funding and state regulations. By speaking with one voice, we can address mutual problems more effectively at the state level. The Suburban Coalition is the only statewide organization that brings together Selectmen, School Committees and Finance Committees and other local officials to jointly advocate for our communities. For more information, visit suburbancoalition.org. Questions? Contact Dorothy Presser at dorothypresser@suburbancoalition.org. 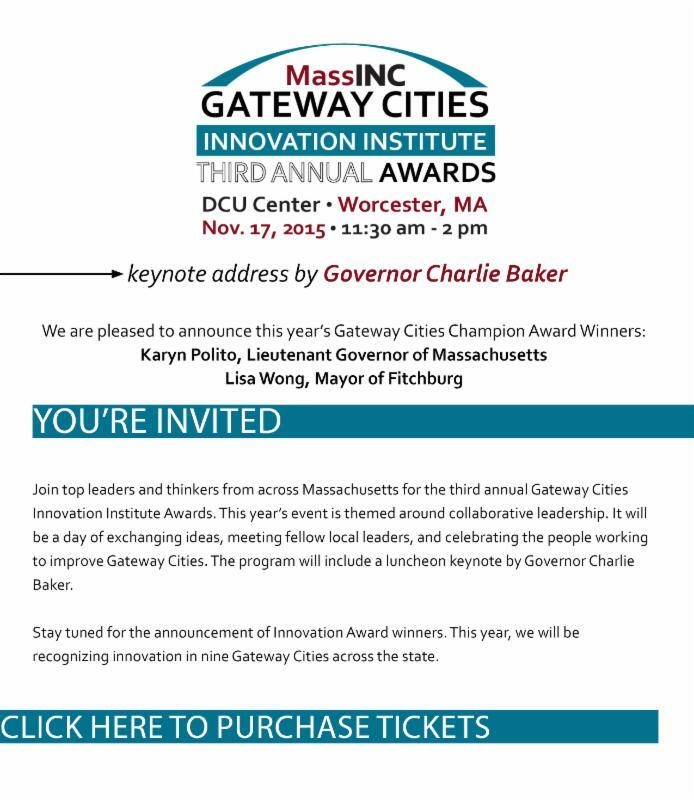 Congratulations to the Five District Partnership, the first of four 2015 Gateway Cities Innovation Award winners. For more information, please contact Jacqueline Stagnari at jstagnari. For sponsorship information, please contact Lauren Louison at llouison. By all indications, the Massachusetts economy is continuing its robust expansion. Employment is growing at rates not seen since the late 1990s. Gross state product growth has consistently exceeded national growth this year. While residential construction remains below pre-recession levels, building activity is increasing and office rents are rising, both strong signals of a growing regional economy. But while these developments are most welcome, a number of risk factors continue to weigh heavily on the state’s economic outlook. Recent job growth in the state has been impressive, with year over year payroll employment increasing by over 90,000 (through August). The technology and knowledge-intensive sectors of the economy continue to lead the way. In particular, jobs in the "professional, scientific, and technical services" industry have grown by more than 5 percent in the past year. This sector includes legal, accounting, architectural, engineering, and specialized design services; computer services; consulting services; and research services, among others. The health services and products sector has been another employment growth driver. This sector includes pharmaceutical and medical device firms, as well as the state’s world-renowned hospitals and other health care providers. The Commonwealth’s knowledge-intensive industry mix continues to drive the state’s economic growth and, to an extent, helps to immunize the state against some of the issues that are weighing heavily on the national and global economic outlook. But several dark clouds have been forming globally. Of particular concern is the apparent decline in the rate of growth of the Chinese economy. Slowing Chinese growth is already affecting nations that rely on China as a destination for their commodity exports, including Canada, Australia, and Brazil, and oil exporters. While the Massachusetts economy is somewhat buffered from these developments, thanks to its relatively smaller reliance on manufacturing exports, they can be expected to exert downward pressure on state export activity. And the Bay State’s professional business services sector, an important source of recent job growth, is exposed to this weakness to the extent it affects their international clients. While the state is relatively well positioned to manage these risks, it is by no means immune from the effects of continued global economic weakness. The overall strong performance of the state economy continues to mask troubling imbalances across the Commonwealth. To date, the growth and prosperity associated with the state’s dynamic technology and innovation sectors has been concentrated in the Greater Boston region, though there appear to have been some positive spillover effects in some other areas of the state. While labor markets in many of the "Gateway Cities" have been improving, in some cases rapidly, their economic performance continues to lag and it is difficult to see this changing anytime soon. Even in the Greater Boston area, income growth has been concentrated at the top of the distribution, and this troubling pattern appears to be continuing. Housing prices and residential rents are rising fast, and putting increasing pressure on the state’s working families, many of whom have had to cope with both stagnant incomes and increasingly unaffordable housing options. Notwithstanding these issues, Massachusetts appears poised to continue its robust economic expansion, at least into next year. This summary reflects the discussion of the members of the Editorial Board of MassBenchmarks at its meeting on September 18, 2015. It was prepared by Executive Editor Robert Nakosteen and was reviewed and edited by the members of the Editorial Board. While discussion among the Board members was spirited and individual Board members hold a wide variety of views on current economic conditions, this summary reflects the consensus view of the Board regarding the current state of the Massachusetts economy. MassBenchmarks is the journal of the Massachusetts economy and is published by the UMass Donahue Institute in collaboration with the Federal Reserve Bank of Boston. Its editorial board is made up of leading economic analysts from across Massachusetts. The opinions expressed by the Editorial Board do not necessarily represent the opinions of the Federal Reserve or the University of Massachusetts. For timely and comprehensive analysis of the Massachusetts economy, please visit MassBenchmarks at www.massbenchmarks.org. High-quality pre-kindergarten is one of the most important experiences we can provide for our children. It can level the playing field for children from low-income families, helping them start their K-12 years ready to learn and succeed. It is a research-based strategy for narrowing the achievement gap. This legislative session, there are several proposals on the table to expand early learning opportunities to thousands more young children in our Gateway Cities and beyond. On Wednesday, September 16, the Joint Committee on Education is holding a legislative hearing on bills related to early education and care including An Act Ensuring High-Quality Pre-Kindergarten Education (H.462 / S. 267). This bill provides a targeted, phased-in plan for providing state funded pre-kindergarten to preschool aged children, through a mixed delivery system with prioritization based on school district accountability status and rates of third grade reading proficiency. Despite leading the nation on many educational benchmarks, Massachusetts has struggled to provide high-quality preschool, particularly for our neediest children and families. An estimated 60% of 3- and 4- year-olds in Massachusetts are enrolled in a formal early education and care program. However, enrollment tends to be lower in Gateway Cities: 52% in Fall River, 44% in Pittsfield, 43% in Brockton, 40% in Holyoke. And quality varies greatly. Programs are subsidized largely by parent fees, which can limit access for children from low-income families. State and federal funding for programs typically fall short of demand and result in waiting lists. While Massachusetts has made progress in building a high-quality system of early education and care in recent years, including making strategic state investments in program quality and winning competitive federal grants, far too many children still enter kindergarten without any preschool experience. An Act Ensuring High-Quality Pre-Kindergarten Education is modeled after New Jersey’s successful Abbott Preschool Program. At full implementation, the legislation would impact children in 72 communities, including Boston and all 26 Gateway Cities. It would give high-quality preschool to more than 25,000 children, who would not otherwise have this formative educational opportunity. In addition, quality improvement funding would improve learning at both private and public preschool programs serving more than 40,000 children by helping these schools hire qualified, well compensated teaching staff, provide additional professional development, and enhance their curriculums. This quality improvement effort would resemble the federal Preschool Expansion Grant program, which Massachusetts has begun implementing for 800 children in five communities. Lessons learned from implementing this program can be used to inform the next phase of pre-kindergarten expansion. Show your support for pre-kindergarten legislation. Let us know if you are interested in submitting written testimony or <a href="mailto:lhealy on September 16th. You can also send a message to legislators asking them to support this important legislation and add your name as a Voice of Support. In a Boston Globe opinion column, Jim Stergios calls on the state to establish an infrastructure fund to promote investment in cities outside of Greater Boston. In Brockton, a health center and a grocer team up in an innovative partnership that backers hope will be a national model. Pittsfield explores options for the Tyler Street Transformative Development Initiative project. The T&G breaks down Worcester‘s startup scene. Haverhill creates a plan for converting vacant industrial buildings on Stevens Street into housing units. Representative Carole Fiola calls for a moratorium on affordable housing in Fall River. Tyrek Lee, a leader in SEIU 1199, writes about the contribution of the American labor movement to Gateway Cities. The Herald News reports on a new AIR study demonstrating gains by Gateway City schools receiving Race to the Top wraparound and redesign grants. Holyoke begins the new school year under state-appointed receiver Stephen Zrike with optimism and good will. Rebecca Cusick, president of the Fall River Educator’s Association, says collaboration is the key to success improving outcomes for students. New Bedford Housing Authority partners with New Bedford Public Schools to expand its summer literacy program into an after-school literary program. The first passengers disembark at the new Holyoke Amtrak station. New research published in the journal Economic Development Quarterly looks at the regional impact of public transportation infrastructure in the northeast and finds a significant contribution to economic growth. The Baker-Polito administration establishes a Seaport Economic Council that will help the Commonwealth build a strong maritime economy. The mayors of Salem and Quincy echo their support. Fitchburg uses a $5,000 TDI grant to install temporary art and music displays in the hopes of making its downtown more dynamic. In Worcester, City Manager Augustus wants to use revenue generated from parking garage surcharges to fund cultural events on the common. The Springfield Museums announce that they are in the final stages of purchasing the childhood home of Dr. Seuss, which is located in the Forest Park section of the city. A current resident of Forest Park and member of the Springfield Museums Board of Trustees writes an email to the neighborhood, seeking ideas for the property. Lawrence celebrates the 152nd anniversary of the Dominican Republic’s independence from Spain with a lively parade and festival. 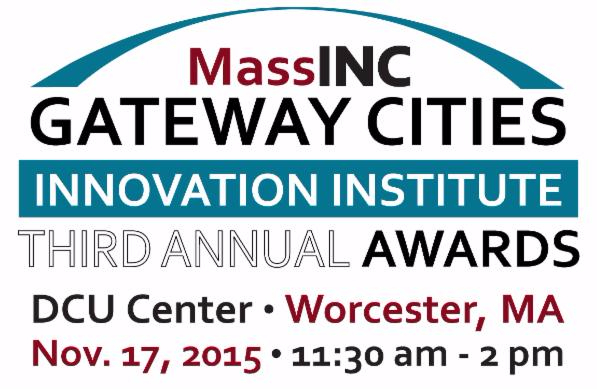 For a full list of Massachusetts Gateway Cities, let us know. If you are not yet on our list and would like to sign up, click here. To contribute news or comments, please <a href="mailto:amiddle.